I’m too stupid to understand this result. Does the first spike mean many people say that 5e is an OSR style product? 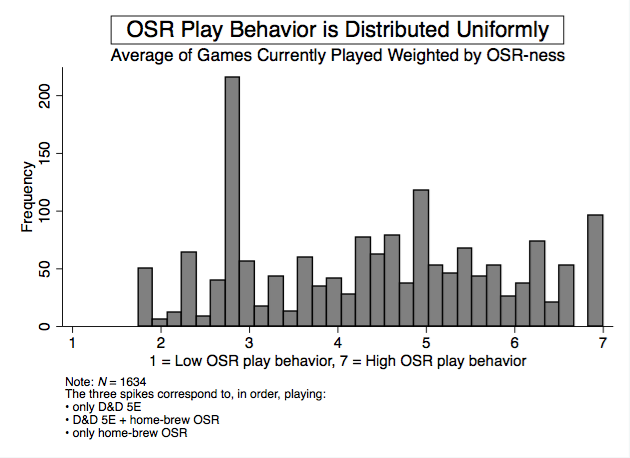 No; the figure shows the distribution of respondent play behavior rated on OSR-ness across responses. You can interpret the midpoint of the scale as something like neutral in terms of game OSR-ness (so neither non-OSR nor OSR). 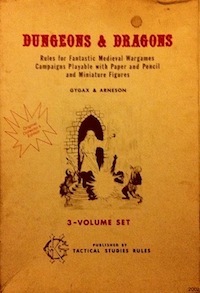 Since D&D 5E has a relatively low OSR-ness rating in the consensual imagination (2 something; check the OSR games post for details), people who only report playing D&D 5E currently get a low OSR play behavior score. That is the highest spike: people who only report playing D&D 5E. The figure is saying something about responses (the behavior of individuals) rather than something about games. Consider the following structurally similar example from a different domain. Imagine you wanted to quantify the behavior of people regarding the ethnic character of their food habits on a spectrum from white bread American to Chinese (obviously an incomplete and oversimplifying spectrum but bear with me). Assuming a seven point scale, Eating at Denny’s might be 1 (not Chinese at all). Eating at some Thai restaurant might be 5 (somewhat Chinese; yes, there is a cultural difference, but keep in mind the comparison set). Eating at Din Tai Fung in Hong Kong might be 7 (very Chinese). Now record all the places a person actually eats and then average the scores for those places. This average serves as an overall summary of the degree to which the person’s eating behavior involves Chinese cuisine. Replace restaurants with games and Chinese-ness ratings with OSR-ness ratings: that is essentially what I have done in this post. Also, the figure is really just meant to provide some visual description of the new variable rather than be the focus of the post. I believe there was a question included in the survey about what type of blog post content folks find most useful. I’d love to see the results of that. Are you planning to address more aspects of the surgery, or have you released the full data, raw or otherwise? I have a lot more analysis remaining to do. Also, looking item by item, identifying with the OSR is positively related to liking all kinds of content. 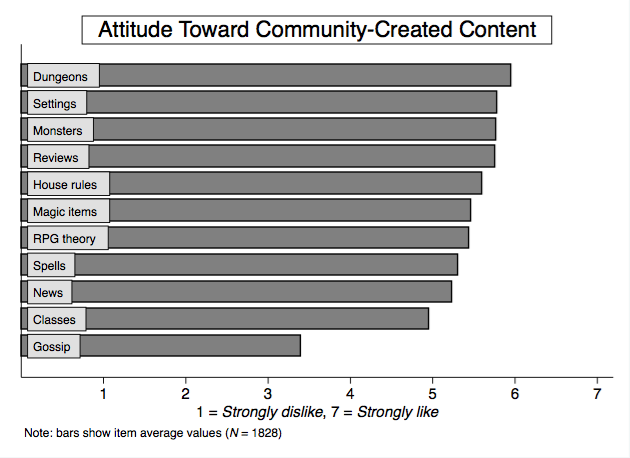 I created an aggregate liking for community content variable by averaging attitudes toward all eleven items, and people who identify with the OSR like community content in general more (R-squared = .17, F(1, 1819) = 381.36, b = .42, SE = .02, t = 19.53, p < .001, 95% CI [.375, .459]). That is a rather substantial effect; one standard deviation increase in identification with the OSR is related to .42 standard deviation increase in attitude toward community-created content. I have not released the raw data. I did not state that I might release the raw data in the survey, so I am unlikely to in the future, though I will likely post a full codebook and zero-order correlation table at some point, which would allow some kinds of analyses by others. Also, if you have a particular question, I can do various ad hoc analyses. Cool, thanks for the brief look Brendan.